The belief that eating out equals a lot of calories paralyzes many dieters -- they feel that in order to lose weight and maintain the loss, they have to stay away from restaurants forever. This is a depressing thought. Closeup shot of young woman eating fresh salad at restaurant. Healthy african girl eating salad and looking away. 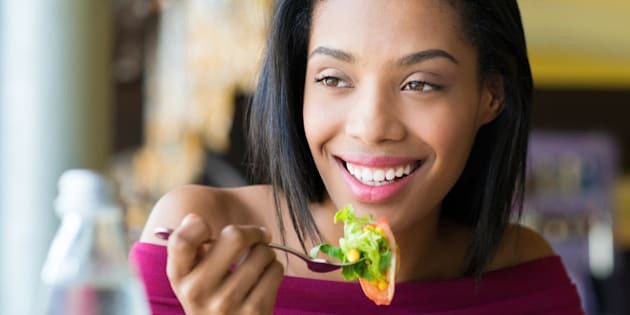 Smiling young woman holding a forkful of salad. Health and diet concept. Woman ina a lunch break. As we become busier and busier with work and family life, and as we look more and more for ways to unwind at the end of a long day, many of us turn to the convenience of eating out to solve the dinner-time dilemma and to socialize with friends and family. Many restaurant menus contain diet pitfalls, including meals that have a day's worth of calories, healthy food loaded down with cream, and fried or salted food that taxes your system. Many of us (myself included) take pleasure in catching up with friends and family, and relaxing while others prepare and serve us a meal. Eating out can be an adventure as we taste new cuisines and experience new spices. If you are afraid to eat out, have convinced yourself you'll never see inside your favourite restaurant, or are eating those cream-filled, fried-salted treats, then this post is for you. I am going to tell you how to order at a restaurant and still lose (or maintain) weight. If you have the opportunity to plan ahead, be sure to check out the restaurant menu before you go. Many restaurants will have their menu posted online. If you don't see one, call ahead and note to the server or hostess that you are following a specific diet plan. Ask for their recommendations (or the chef's recommendations) for a light, healthy meal. If you are currently gluten- or dairy-free, use these specific words. Many major chains will also post nutritional content of their most popular meals. This is a great way to figure out in advance what will be your healthiest pick. And don't fall into some common pitfalls: salad isn't always the healthiest option (especially when it is topped with a lot of creamy dressing). This is a tip that is especially important if you are attending a buffet. Cut your plate in half visually and stack vegetables to cover half of the plate. When ordering for table service, ask for extra vegetables or a salad (with a balsamic vinegar dressing on the side) in place of the starch option. Most restaurants will be happy to make this happen for you. Always steer clear of anything that is fried. Even fried vegetables are too much grease, oil and fat for your body. They pack in the calories, leave many tummies feeling queasy, and can contain trans fats. Trans fat are harmful to your health, as they raise your cholesterol levels -- a risk factor for heart disease. When out for sushi, steer clear of the tempura and focus on fresh vegetables and fish. Here's my trick for ordering at just about any restaurant: without even opening the menu, ask for a piece of grilled protein and a plate filled with steamed vegetables. It is a dish that almost any restaurant can prepare, and it will leave you feeling satisfied without being weighed down by any unhealthy, fat-filled food. Just remember to hold the butter and salt, as well as any dressing -- a squeeze of lemon on your vegetables and protein is all you need. Don't blow all your calories at the bar! Allow yourself to enjoy one glass of wine or mug of beer, and sip it slowly so it lasts the entire meal. It can be easy to get caught up chatting with friends and to consume more alcohol than we intend to. Be aware, sip slowly and always have a glass of water to balance out your intake. Take these tips with you whenever you go to a restaurant, whether you are dining out of necessity while travelling or catching up with family and friends. It is possible to have your cake and eat it, too (actually, I don't recommend you eat cake at a restaurant! ).